Rev. 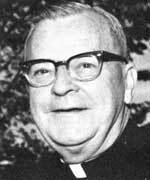 Emmett M. Walsh, CSV, 69, died Sunday, October 6, 1974 at Northwest Community Hospital in Arlington Heights. He had been living at the Province Center, provincial headquarters of the Clerics of St. Viator, prior to his death. A native of Streator, Fr. Walsh received a bachelor’s degree from St. Viator College, Bourbonnais, IL and a master’s degree in English literature from the Catholic University of America in Washington DC. He had been a member of the Clerics of St. Viator for 50 years and celebrated his 40th anniversary as a priest in May, 1974. He devoted much of his life to teaching English literature at St. Viator College; Dowling College, Des Moines; Fournier Institute, Lemont; Catholic University of America and Loyola University, Chicago. Since 1959 Fr. Walsh had been engaged in promoting devotion to the angels as director of the Philangeli Association and often said Mass at Our Lady of the Wayside Church in Arlington Heights. Fr. Walsh also is credited with helping to establish some of the early traditions at Saint Viator High School, which opened in 1961, including featuring the red lion in its logo, as well as bringing the school song from the closed St. Viator College to the new high school, and adding decorative elements to its chapel. “He wanted the school to be tied into the community’s roots in Lyons, France,” says Br. Don Houde, CSV, a friend and confrere. Visitation was held from 2 – 9:30 p.m. on Oct. 8, 1974 at Lauterburg and Oehler Funeral Home, 2000 East-Northwest-Highway in Arlington Heights with a wake service at 8 p.m. The funeral Mass was held at 11 a.m. on Oct. 9, 1974 at Our Lady of Wayside Church, 432 Mitchell Ave., Arlington Heights. Principal celebrant was Fr. 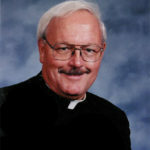 Kenneth Morris, CSV, Provincial and the homilist was Fr. William A. Harris, CSV. Burial was at Queen of Heaven Cemetery, Hillside, Illinois in the Viatorian Community plot.